Paper, Pens and Pretty Things : Cutie Pie Challenge Blog – Use A Cute Digi! Today there is a brand new challenge over at the Cutie Pie Challenge Blog and our theme this fortnight is a very simple one! Use a Cute Digi! 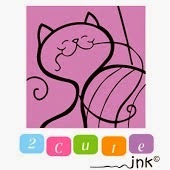 This time we are sponsored by the fabulous 2 Cute Ink Stamps! Cute and quirky illustrations used for card making and paper crafting! Now the DT got to play with some of the sponsor’s adorable images and I chose to use Primrose Kitty! Isn’t she just the sweetest?! Pop over to the Cutie Pies blog to see the amazing inspiration created by my teamies. Gorgeous card Jane. I love the cute image, pretty colours and such a beautiful arrangement of flowers! Nope, definitely not too many flowers.....all so gorgeous! This is so sweet Jane and with your fabulous detail. Totally gorgeous - the flowers are just perfect!!! Gorgeous card Jane, love the very cute image and beautiful details. Loving this sweet image- and love your layout with the colors and the layers! I have to mention the fab bouquet of flowers as well : ) Thanks for joining the challenge at Card Mania! Oh my word Jane this is absolutely gorgeous I totally adore that image and what a stunning design it looks amazing and I love it all. ong, that is so so so cute, Jane! Love that flower arrangement too! Such a cute image and beautiful card. Thanks for sharing it with us over at Creative Moments. Love the shape and all the flowers on your gorgeous purple card! Thanks for sharing with us at The Paper Nest Dolls.. hope we see you enter again soon!